How To Grow Turnips | Grow This! 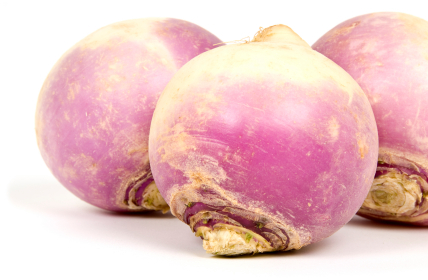 Turnips are popular in Europe and the American south. Often grown in the U.S. only for their greens, the leaves and the root of the plant can be harvested at different times and make delicious, nutritious additions to many different culinary dishes. Turnips need very little care and are ideal for outdoor, home gardens. Here’s how to grow turnips. Turnips come in many different varieties. The most common variety referred to as a “turnip” is the white turnip. Rutabaga, sometimes called a “turnip” or “yellow turnip,” is actually a cross between the turnip and cabbage but is grown the same as most any other type of turnip. Choose a variety best suited for your growing region. Fast growing turnips are good for warmer climates as they are best if harvested when the weather is still cool. Some varieties’ flavor will improve with a nip of frost in the late fall. Turnips can be grown in the spring or fall. They are often better when harvested when temperatures are still cool in the spring or just after the first light frost of the autumn. Turnip seeds should be sown directly into your outdoor garden bed as soon as the soil can be worked. For fall harvest, plant them 7 to 8 weeks before the first frost of the fall. In the warmest regions, grow zones 9 & 10, turnips can be grown during the winter. Sow fresh seeds every 2 weeks for a continual harvest. Turnips grow best in temperate climates. Choose a space that gets full sun exposure, though turnips can tolerate partial shade. Choose a spot where turnips and other cole crops (mustard family plants) have not grown in recent years. Turnips need well-drained, loamy soil in order to thrive. Be sure the soil has a neutral to slightly acidic pH (6.0 to 7.5). Enrich soil with compost to be sure it is fortified with plenty of nutrients. Be sure your garden bed is deeply tilled. Turnips need deep soil in order to flourish. Sow seeds ½ to 1 inch apart or plant seedlings 4 to 6 inches apart. If growing from seed, thin seedlings to 4 to 6 inches. Carefully and thoroughly weed to avoid root competition. Use organic mulch to help, which will also maintain moisture in the soil. Turnips need lots of consistent watering. Keep the soil evenly moist without letting it get soggy. Turnips will benefit from a regular feeding of compost tea after they emerge and begin to develop. When growing turnips primarily for the greens, try a nitrogen-based organic fertilizer. Most varieties of turnips are ready for harvest after about 5 weeks. Rutabagas take 2 to 3 months. You can harvest the leaves (turnip greens) when they are large enough to eat. Leave some greens attached to keep the roots alive until they mature a few weeks later. Do you have tips on how to grow turnips? Let us know in the comments section below.